Why can they be considered pests? To put it simply… they will destroy your home! Your home is the biggest investment you are going to make and these little buggers will eat through the wood and cause thousands of dollars of damage and decrease your property value if not treated. First of all, you need to know that only a technician with a special termite licence can legally deal with your termite problem. Our licenced termite technicians will provide you with the best possible solution. Each location is unique so a thorough inspection will be conducted. We will bring the latest termite sensing equipment and imaging tools to determine the extent of any moisture damage not visible or blocked behind finished walls. A detailed report will be provided and discussed with you so that you understand the situation and options that are available. As a customer what are my responsibilities? The important part is to give us a call if you suspect termites or live in areas that have been identified as having termite problems. It is very important for a professional to identify if a termite infestation exists. The inspection report will provide you with confirmation and the details of the infestation. Based on the size of your home and the extent of the problem we will give you a firm quote. The price will include the treatment program, follow-up inspection, maintenance options and guarantee. The species of termite that is most prevalent in Ontario is called the Eastern subterranean termite (Reticulitermes flavipes). These termites can cause great damage to dwellings if undetected and/or left untreated. Living in social colonies under ground they are attracted to cellulose found in wood and other products. Needing constant soil protection in order not to dry out, they build shelter tubes to bridge the gap between soil and wood. They are attracted to moist wood and damp environments. It is essential that any moisture problems in the house be resolved in order to keep termites in check. Is rainwater being allowed to drain off the roof with ease? Do downspouts empty away from the foundation? Does the land slope away from the structure? Grade sloping towards the structure can cause a potential moisture problem. Do any cracks exist in the foundation? Is it in need of repair? Is there any wood to soil contact around windowsills and sill plates? Do they need to be reconstructed? Look for other locations on the property where wood is in contact with the soil (i.e. dead trees, stumps, scrap lumber, firewood). Firewood should be placed on concrete pads or off the ground. Look under the deck. Does at least 50 cm of clearance exist between soil and the wood joists? Is the basement damp? Are exhaust fans properly vented to the outside? 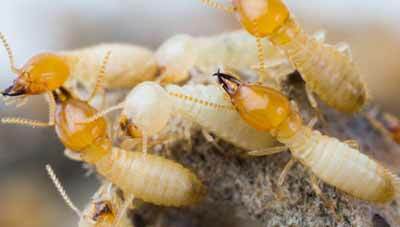 High humidity can cause moisture problems which creates an ideal environment for termites. One key component to controlling moist environments is ventilation. Running a dehumidifier can help control dampness in a basement.